Toast cool design with this sturdy and stunning white wine decanter featuring an open ice chamber that keeps wine cold without diluting it. Handmade in Colombia from recycled glass, each decanter has a slight green hue from the tint originally added to lessen the sun's glare. Due to the hand-crafted process, the texture of each item will differ. Air bubbles and small "imperfections" add individual charm to each one-of-a-kind piece! 16" H, 6" dia., 48 oz. Also available with a matching set of two Recycled Wine Glasses. 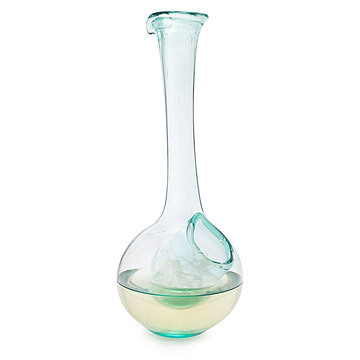 Please note, the Recycled Glass White Wine Decanter has been discontinued. When it sells out, it will no longer be available. This was a gift for a couple of wine lovers. They live in a hot climate so it made sense to choose this piece. They loved it. What a unique piece for any wine lover! When I got this in the mail, it was scratched. this was a gift so it needed to be perfect. A quick call to customer service & they shipped me a new one right away - they didn't even require me to send back the old one! The new one was perfect & the gift recipients were quite impressed with their gift. The service I received means I'll come here often for gifts in the future. That's what customer service should be like! MIL loved this gift. She has sent pictures of it being used multiple times. She always asks for kitchenware, but I didn't want to get boring stuff. Last year we got her a tea kettle.. you can only buy those so often. Who doesn't love wine? I would love to buy one for myself. I read other reviews before purchasing and have to say I went ahead and ordered it even though some reviews were "balanced". It is a very large vessel, so you'd have to pour an entire bottle of wine in the carafe and let sit some some time to get the impact....however it is pretty unique and should be a fun conversation starter. Great looking and very useful. Conversation piece. Buy this for style, not function. Barely keeps wine cold, as the trough where the ice is held doesn't reach down far enough to chill a bottle of wine. If you had two bottles of wine in there, perhaps it'd work, but who's cracking two of the same bottle of wine at the same time? Also hard to pour out of, given its length. Cool looking, however, nice ornament for the kitchen. This was a big hit at a wedding shower where the bride-to-be received mostly items from her registery. I like something a little different and this fit the bill perfectly. I only drink white wine as do most of my friends- this is a stylish way to serve white wine and at the same time keep it cold. Bought it for my sister for Christmas. It was perfect for New Years and was the topic of conversation. Perfect gift for a wine lover. This handmade Recycled Windshield White Wine Decanter is brilliantly designed to keep your white wine cold without diluting it.